Compact, carpeted room with all the amentities required including airconditioning, TV and much more. Thesee rooms are located on our first floor. Comfortable ground floor room with airconditioning, TV, Fridge and most amentities. Some fully tiled, some carpeted, fully ensuited with parking outside your door. omfortable ground floor room with airconditioning, TV, Fridge and most amentities. Some fully tiled, some carpeted, fully ensuited with parking outside your door. This fully tiled large room comfortably accommodates 3 people, is airconditioned, ensuited and has an equipped Kitchenette for self catering. This fully tiled large room comfortably accommodates 4 people, is air conditioned, ensuited and has an equipped Kitchenette for self catering. 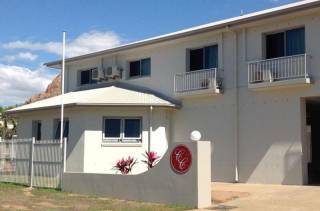 Banjo Paterson Motor Inn & Restaurant in Townsville is famous for its good old fashioned service, quality rooms, delicious food and affordable accommodation. Each room is decorated and equipped to ensure you feel as comfortable as you do in your own home. You’ll enjoy a relaxed atmosphere, swimming pool, BBQ area, and a whole range of facilities, along with a fully licenced restaurant and bar. 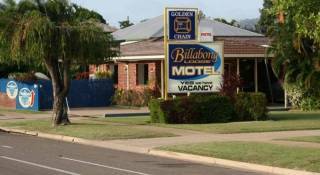 Whether you want to stay in Townsville for business or leisure, once you’ve stayed with us here at Banjo Paterson Motor Inn & Restaurant, you’ll want to relive the experience over and over again. Come and experience Banjo Paterson Motor Inn. Stay where the Country meets the City! 25 units all with air conditioning, Television, Toasters, Tea making facilities, Fridge & hairdryers. Units are spacious and clean, 6 rooms are semi self-contained with small kitchenettes suiting families or sporting groups. 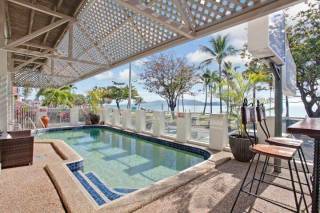 A relaxing pool and BBQ area for guest use. Enjoy good old fashioned home cooked evening meals at Banjo's Restaurant Monday to Saturday with Breakfast available seven days. Guest laundry on site. 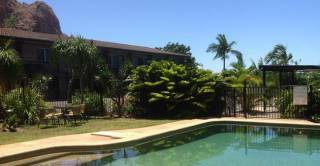 Located close to sporting facilities, Hospitals,University, Race track, Golf Course and parks. 48 Hr prior to check -in.